YouCantMissThis.com- By Bones Rodriguez: "Autobots- Roll Out!" and saw the TRANSFORMERS movie that I had been waiting for for over a year. I was giddy with antici.....pation as the previews started, and there was one for some J.J, Abrams movei. At first I thought it was Star Trek XI, but the release date was wrong.. I guess well find out what that is later. 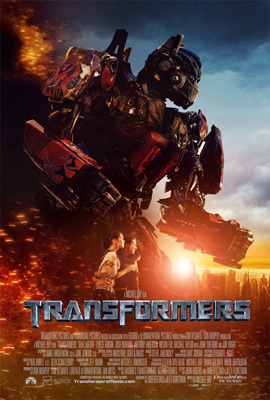 As for TRANSFORMERS, I liked it. I didn't LOVE it. There was a ton of fanboy stuff "One shall stand, one shall fall", and "Autobots- Roll out!" were quotes that excited the hell out of me. However, the script was pretty bad, in that they spent ENTIRELY TOO MUCH TIME with stupid stuff. Megatron was only in it for 20 minutes, and fights were all too close up, so you couldn't see what was happening. For a lot of the shots, it was just a jumble of metal, and no distinguishable movement. I wish they didn't spend so much time "Looking for the glasses", as they didn't have what they needed on them anyway. Overall, I would say it was better than Fantastic Four, but not as good as Live Free or Die Hard. It wasn't the movie it could have been, but it wasn't Daredevil either.